If you don’t like leaving Github and want your project managers to stay informed on what you’re working on without having to log into a PM stack - now you can! In your Space, go to to Admin and select Integrations. Authorize your GitHub account by choosing Settings and then Authorize GitHub. Keep in mind that the GitHub integration will only appear if it has been paid for and enabled from the payer's account page. If you would like to add repos from your organization, you will need Owner permissions. If you do not have that level of access, then you will only be able to see your own GitHub repos available for integration. Troubleshooting Tip: Do you have Owner permission but still can't see repos from your organization? Try revoking GitHub permissions here and then reintegrate with Assembla. 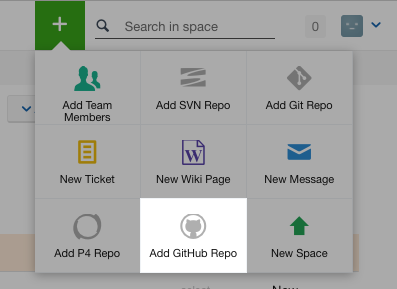 Open the green "+" button and select Add Github Repo. Choose the repo you want associated with your project from the dropdown menu that appears. This will automatically install the necessary webhooks on the GitHub side to ensure all events are delivered to Assembla in real-time. While in Assembla, open a ticket in your project and find the GitHub button on the left of the screen. Click on it to find the pull requests you want to associate with this ticket. This allows project managers or dev leads to tag any pull requests to a ticket without relying on their devs.